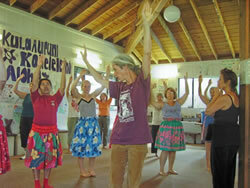 Last week’s visit from our Hula Sister from Germany was a welcoming experience in my life. 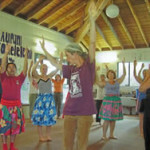 I greatly enjoyed speaking (and singing) German again and connecting with new and old friends, realizing that I already felt quite a deep connection with those who danced Hula with us two years ago in Germany. 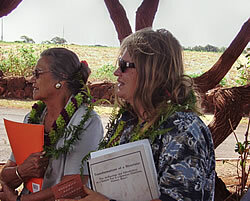 And what a wonderful surprise to see Susan, Lynny and Cheryl again, together with out Kumu(2) here on Kauai. The “macrame” of our symbol surely works well. It was a great pleasure to go up to Ke-Ahu-A-Laka and sing and dance together, to learn more, and most of all to experience harmony and Aloha. Thank you everyone for making this happen, especially Roselle and Jim for their devotion and Love! 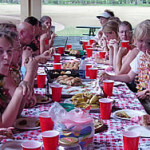 Many mahalos are due to others besides the core group (Pat, Savitri, Penny, Sherrie, Birgitta, Cherie, Kim, Louise, Fran,et al) who organized food, transport, and events. Special thanks to Limahuli Gardens, the Koke’e Discovery Center, the Kaua`i Museum, the Kaua`i Visitors’ Bureau, Hoku Char, Dave Boynton, Marsha Erikson, Carol Lovell, Aletha Kaohi, Nancy Mc Mahon, and the hospitable staff of Brick Oven Pizza. A reputed old Chinese proverb (actually coined by an American advertising executive in the early 1920’s) holds that one picture is worth a thousand words. Here are quite a few thousand words worth of images from the weekend. 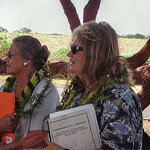 Kupuna Aletha Kaohi and archaeologist Nancy McMahon explained the historical and cultural significance of Pa`ula`ula (aka the Russian Fort) to the guests. 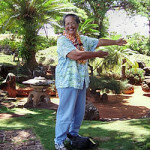 The guests also learned “E Ho`ike Aloha Ni`ihau” and performed it for their hosts during their last afternoon on Kaua`i. 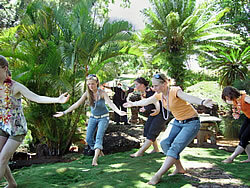 Birgitta teaches the visitors “Koke`e” during their stay at Koke`e Discovery Center. 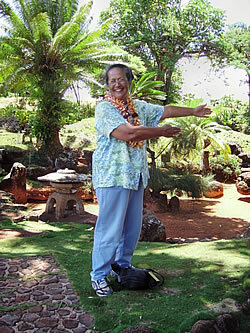 “I am descended from police officers”, remarked Roselle, demonstrating her traffic directing skills at Kukuiolono Japanese Garden. 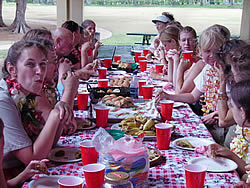 Kaua`i welcomed the guests with lunch at Lydgate Park.